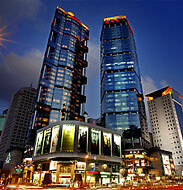 Be it self-catering, or full-serviced apartments, find the best in extended stay apartments and extended stay hotels in Shanghai , by going directly to long stay and apart hotel websites. Check availability and amenities such as self-catering; self-service and full-service in directly from each long term stay property. The award-winning property is strategically located in front of the idyllic oasis of Century Park in Pudong, metro line 2 Century Park Station is next to hotel side entrance, providing easy access to Lujiazui financial district, Zhangjiang High-tech Park and Jinqiao EPZ; Pudong International airport is a 8-minute Maglev train ride, inter-change to and metro line 2, one stop to Century Park Station. Discerning business travelers can reach the Kerry Parkside and Shanghai New International Expo Center within 15 minutes walk or a 5-minute drive by the hotel free shuttle bus service. Setting itself apart from other four-star hotels, Dorsett Shanghai boasts a distinctive design and luxury service, offering more than 80 percent of comfortable guestrooms and Loft Suites with balconies provide front seat to a panoramic views of Century Park and the metropolis. Dorsett Shanghai offers superb food and beverage in three restaurants and lounges, all day dining outlet serving international cuisine - from Asian delicacies to Mediterranean favourites, breakfast buffet and refreshments while Chinese restaurant specialties in crab dishes and Shanghai cuisine. Fengshui Bar is a quite lounge prefect for winding down at the end of a busy day, outdoor Breeze is great spot for refreshments and relaxations. Hotel meeting venue offer a total of 500 square meters, which is able to divide into 5 meeting venues for smaller meeting groups. Each of the conference facilities with state-of-the-art facilities, designed with the needs of business travelers in mind. 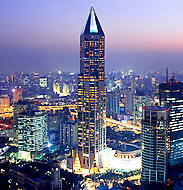 Dorsett Shanghai fuses urban life with natural tranquility for a restful stay.